Pets, just like people, need to take clean water every day. However, unlike people, pets can’t find clean water on their own and so require the pet owner’s intervention when it comes to getting healthy and clean water. As the owner, you may not always be there to get some water for your cat. So how can you ensure that your cat or dog gets enough water every day? The answer is by using a pet water station. The PetSafe Healthy Pet Water Station is one of the best pet water stations that you can get for your cat. PetSafe is a leader when it comes to innovation related to pets, having been running for about two decades now. 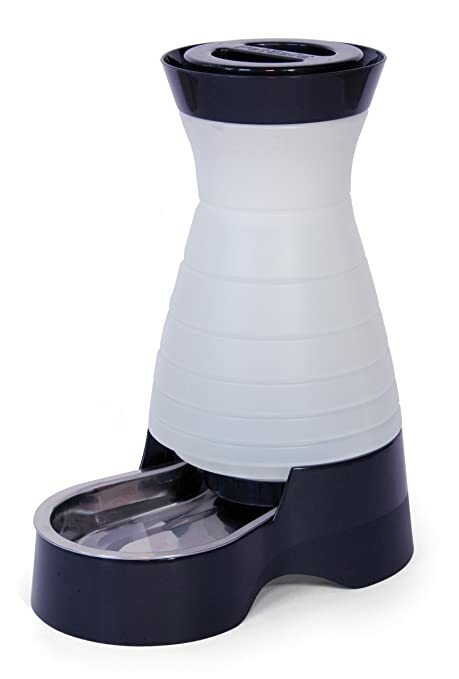 Besides this water station, PetSafe has created amazing pet feeders. In fact, the company has contributed greatly to the list of the best automatic cat feeders. The PetSafe Water Station reservoir is made of high quality plastic, while the drinking bowl is made of stainless steel. Stainless steel cannot be scratched by cats, and is also much easier to wash. It is dishwasher safe, meaning the whole process of cleaning it involves throwing it into the dishwasher. The reservoir of the medium sized unit can hold 1 gallon of water. The water station works automatically, but not like a timed cat feeder. Instead, the reservoir will refill the drinking bowl whenever the bowl is empty, regardless of how often this happens. This means that your cat will always have water to drink throughout the day. The unit has a water flow control valve that prevents water from spilling whenever it refills. Another great aspect of this unit is its beautiful design. The water station can easily blend with anything in the room. The product comes with three different options, in terms of size. You can get a small unit, a medium unit, or a large unit. The smallest unit can only hold a half a gallon at a time, and will probably cause you some inconvenience. The reservoir of the large unit can hold two and a half gallons of water, meaning fewer refilling trips for you. It will save you the trouble of always having to get water for your cats and dogs. Once you fill the reservoir, you can relax and carry on with your day. The unit comes with a dishwasher safe drinking bowl. The reservoir is BPA free, meaning it is safe for your cat. The dish easily pops out, after which you can clean it. The material used to make the container is translucent, and this allows you to see how low the water has gone. Basically, you can know when to refill the unit. The design of the unit goes well with most rooms and even outdoor environments. The dispenser does not make any noise as it drops water in the bowl. It does not even create bubbles in the water. This gives the cats and dogs a more peaceful time drinking water. Some cats actually avoid water dispensers simply because of the noise and the bubbles made since the reservoir has to keep refilling the bowl consistently. The other parts of the unit, apart from the drinking bowl, have to be cleaned manually. This water station is meant to be used indoors. However, if your environment is safe and there are no other pets that can tip it over, then you can always place it outside. Although the stainless steel dishwasher is safe for use, you can sterilize it regularly to prevent contamination of the water by harmful microorganisms. To do this, simply heat it under high temperatures, then let it cool, after which you can let your cat drink out of it. To make the water even safer for your cats and dogs, you can use the optional Healthy Pet Water Filter to filter off contaminants such as chlorine from the cat’s water. Also, you will find it helpful to clean the drinking bowl once every day, especially if you serve your cat hard water without taking it through any filtration. Otherwise, the mineral deposits in the water will discourage your cat from drinking the water. Another point you might want to consider is how many of your pets will be using the unit. In the same vein, you need to consider how much water they take on overage. If you get a small or medium sized unit for many pets, you will still have your old job of getting water to them every now and then since they will drain the reservoir really fast. If you like to go for long periods of time without refilling the reservoir it would be advisable to go for the large station. Some cats like to drink colder water. If your cat falls in this class, you can help it drink by dropping a few ice cubes in the water reservoir. This will cool the water down, at least in the short run. You will also need to teach your cat to use the unit to get its water. A simple way is to position the unit at a point where your pets used to previously get water. Then you need to get rid of the drinking bowl that was previously used. That way, they will have to start using the water station. Before the catch on with the purpose of the unit, you can still give them water like you used to. They are bound to learn how to use the unit with time. Finally, if you notice that your cats are reluctant to using the water in the station, you can try to investigate the reason for this. The problem could be the size of the drinking bowl or the water you use, or something else. Knowing the problem is a big step in solving it. Just as you can feed your pet using an automatic cat feeder, you can serve its water automatically using a water station. This unit is a great and worthy investment on your pets. We would highly recommend that you purchase this product.